StiffGuard® features a complete high-end security platform. Take a look at some of our highlights, but remember StiffGurad® Features are much more than we can showcase. Dashboard. StiffGuard® offers a dashboard feature to quickly check the status of your StiffGuard® Firewall. Shown is the latest version with drag and drop multi column support. Modern User Interface. The modern user interface offers a great user experience with multi language support, build-in help and quick navigation with the search box. Shown is the fast search navigation option. Stateful Firewall. A stateful firewall is a firewall that keeps track of the state of network connections (such as TCP streams, UDP communication) traveling across it. StiffGuard offers grouping of Firewall Rules by Category, a great feature for more demanding network setups. Aliases & GeoLite Country Database. Managing firewall rules have never been this easy. By using Aliases you can group mulitple IP’s or Host into one list, to be used in firewall rules. Additionally IP or Hostnames can be fetched from external URLs, examples are DROP (Do Not Route Or Peer), Abuse.ch’s Ransomware tracker and the build-in Maxmind GeoLite2 Country database. Traffic Shaper. Traffic shaping within StiffGuard® is very flexible and is organized around pipes, queues and corresponding rules. The pipes define the allowed bandwidth, the queues can be used to set a weight within the pipe and finally the rules are used to apply the shaping to a certain package flow. The shaping rules are handled independently from the firewall rules and other settings. Captive Portal. Captive Portal allows you to force authentication, or redirection to a click through page for network access. This is commonly used on hot spot networks, but is also widely used in corporate networks for an additional layer of security on wireless or Internet access. StiffGuard® offer most enterprise features including Radius and voucher support. Virtual Private Network – IPsec & OpenVPN GUI. StiffGuard® offers a wide range of VPN technologies ranging from modern SSL VPN’s to well known IPsec as well as older (now considered insecure) legacy options such as L2TP and PPTP. Site-to-Site and road warrior setups are possible and with the integrated OpenVPN client exporter, the client can be configured within minutes. Looking for a IPsec or OpenVPN GUI, you just found something better! High Availability / Hardware Failover (CARP). StiffGuard® utilises the Common Address Redundancy Protocol or CARP for hardware failover. Two or more firewalls can be configured as a failover group. If one interface fails on the primary or the primary goes offline entirely, the secondary becomes active. Utilising this powerful feature of StiffGuard creates a fully redundant firewall with automatic and seamless fail-over. While switching to the backup network connections will stay active with minimal interruption for the users. Intrusion Detection & Prevention. The inline IPS system of StiffGuard® is based on Suricata and utilizes Netmap to enhance performance and minimize CPU utilization. This deep packet inspection system is very powerful and can be used to mitigate security threats at wire speed. Integrated support for ET Open rules. The ETOpen Rule set is an excellent anti-malware IDS/IPS ruleset that enables users with cost constraints to significantly enhance their existing network-based malware detection. Integrated SSL Blacklist (SSLBL). A project maintained by abuse.ch. The goal is to provide a list of “bad” SSL certificates identified by abuse.ch to be associated with malware or botnet activities. SSLBL relies on SHA1 fingerprints of malicious SSL certificates and offers various blacklists. Integrated Feodo Tracker.Feodo (also known as Cridex or Bugat) is a Trojan used to commit ebanking fraud and steal sensitive information from the victims computer, such as credit card details or credentials. At the moment, Feodo Tracker is tracking four versions of Feodo. SSL Finger Printing. The IPS option to allow user defined rules include the option for SSL fingerprinting. With this option SSL communication can be blocked at the initial connection attempt by dropping the SSL key exchange. Backup & Restore. Better safe than sorry, always keep an up to date backup of your configuration. It’s easy with StiffGuard®. History.Automatic backups of configuration changes make it possible to review history and restore previous settings. Backup. Easily download a backup from within the GUI and store on a safe place. Encrypt the backup with a strong password and make plain text unreadable for unauthorized persons. Restore.Upload your configuration backup file and restore it with ease. Cloud Backup. StiffGuard® supports encrypted cloud backup of your configuration with the option to keep backups of older files (history). For this purpose Google drive support has been integrated into the user interface. System Health.A modern take on RRD graphs with the option to zoom in and export data. Netflow Exporter. Use your favorite netflow analyzer to see most active users, interfaces, ports & applications. Insight – Intergrated Netflow Analyzer. StiffGuard® also offers an integrated Netflow analyzer without the need for additional plugins or tools, similar to what you may find in high-end commercial products. Firmware & Plugins. 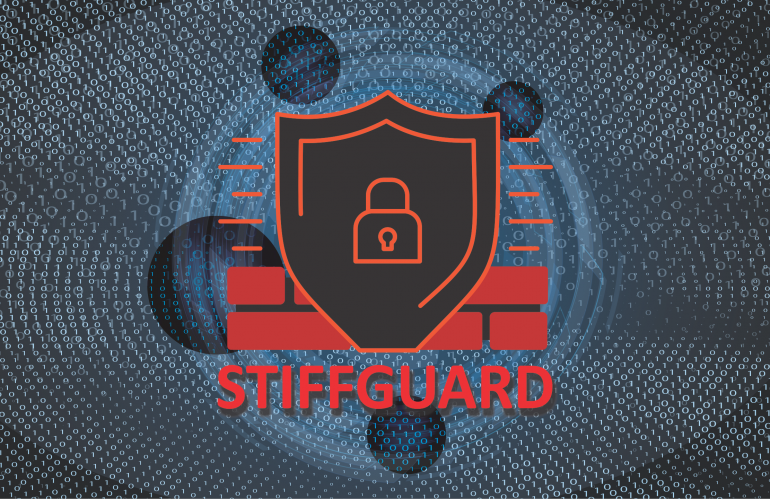 Offering a robust firmware upgrade path to react on emerging threats in a fashionable time; StiffGuard® is equipped with a reliable and secure update mechanism to provide weekly security updates. A plugin mechanism can be used to install additional packages and customizations. Free Up-to-Date Online Manual. Our online documentation is completely searchable, up-to-date and offered for free. Features are explained in detail and examples are provided in the form of how-to’s , making configuring StiffGuard® as simple as possible. See wiki.stiffguard.com.